Photovoltaic technology can provide clean, safe and reliable renewable energy, low operating cost, minimum maintenance requirements, zero fuel cost and long service life (more than 20 years). These advantages makes the off grid photovoltaic applications technically feasible and economically competitive. Solar power generation has been proved to be able to meet the social needs of future energy sources, and is a non polluting power generation mode. 450000 off grid solar systems (typical 35-100Wp capacity) have been installed in India; In developing countries, such as Nepal (61%) the majority of the population without electricity, the government has to give priority to rural areas, suburban electrification, and solar power generation network technology is one of the most widely used power generation technology. One of the typical examples of off grid PV applications is the 1kW PV array of the VanGeet off grid photovoltaic base in Colorado, USA. In this case, extending 1.5 miles to the building of power network at an estimated cost of $100000, of which, including amorphous silicon PV array with MPPT solar charge controller, 42.7kWh inverter battery combination 4kW, those with high efficiency building design combined, proved in economy and environmental protection are very successful. Photovoltaic application in 2010 global shipping has been more than 16GWp, the market accounted for 87% of crystalline silicon material. Although the efficiency of world class polycrystalline silicon batteries has been reported to be as high as 20.3%, the efficiency of the typical commodity silicon module is only 13.4%, but it is still selected as the basis for this research. Because of the PV array power requirements provided by solar photons, the photovoltaic array does not power at night, electric power in cloudy or overcast local climate below the peak, the PV array with discontinuity. In order to ensure the continuity of off grid PV applications, these factors require battery energy storage. The DC output from the PV array is firstly converted into AC (DC-AC) through the inverter, and the published inverter efficiency range is 85.8%-92.4% (maximum efficiency). However, when the polysilicon PV array is used, the total system efficiency of the inverter is about 10%. 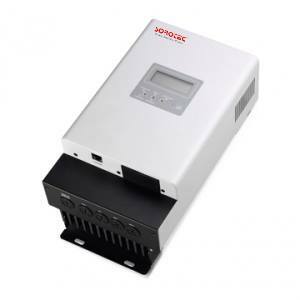 Under such a low conversion efficiency, the loss associated with the inverter should be minimized.